Wesley is a 9 year old chocolate Labrador retriever who presented for grunting while lying down over a five month period and decreased activity over one year. After three sessions of acupuncture his grunting decreased and his activity increased slightly. 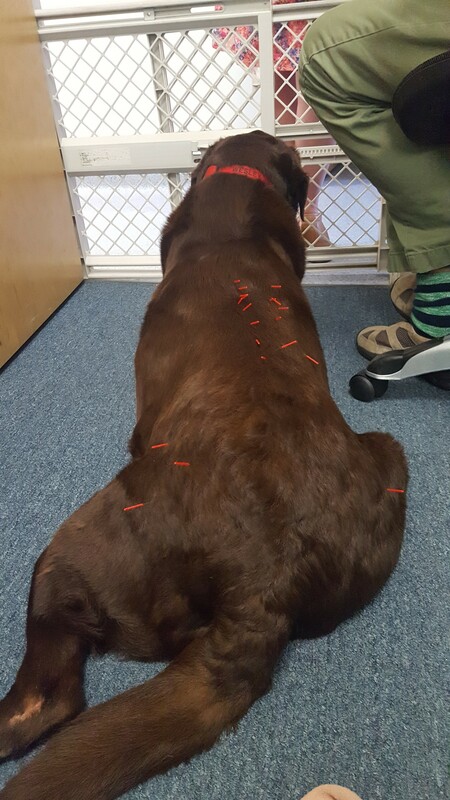 The owner felt he saw moderate improvement and decided to continue acupuncture as needed for Wesley’s daily wellbeing. Wesley is a 9 year old chocolate Labrador retriever who presented with a history of grunting while laying down over a period of five months and a history of decreased activity over one year. At presentation he did not have any comorbidities. His previous surgical history included neuter, growth removal and dental cleaning. He does not have any previous traumas and he lives a sedentary life style as a pet. Wesley’s heart rate, temperature and respiratory rate were within normal limits on physical exam during each exam. His bloodwork was within normal limits. Diagnostic imagining has not been performed on him previous to treatment. On physical exam he was found to be slightly overweight with a body condition score of 7/9. For his neurologic exams his conscious proprioception and reflexes were within normal limits during each exam. Orthopedic exam was found to be within normal limits. On myofacial palpation there were multiple trigger points and taut bands present along the left and right epaxial muscles. Tenderness to palpation was found present over the shoulders, the left and right epaxial muscles in the thoracic and thoracolumbar spine. Tenderness was also found over both the left and right hips. For treatment for Wesley’s trigger points and taut bands I was going to focus on neuromodulation of the areas affected. For treatment of the tension found in his neck region I decided to treat his cranial cervical spinal nerves, cervicothoracic spinal nerves and cranial thoracic spinal nerves. For treatment of the trigger points found along the epaxial muscles I decided to treat his midthoracic spinals nerves, caudal thoracic spinal nerves and his thoracolumbar spinal nerves. Lastly, for treatment of his pain on palpation of the hips I decided to focus on areas that relate to the sciatic nerve. While focusing on neuromodulating these areas I was trying to influence myofacial dysfunction by decreasing wind-up and decreasing raised sympathetic tone. My differential diagnoses were intervertebral disc disease versus hip dysplasia/degenerative joint disease versus myofascial dysfunction. Intervertibral disc disease is a differential diagnosis based off of the history of decreased activity and a grunting noise. This was lower on my listed due to the fact that his clinical symptoms were stable and not progressive. This is the same reasoning against this being a diagnosis of degenerative joint disease. This does not seem to be a progressive disease in this patient. My final diagnosis is local pain due to myofasial dysfunction. There may be underlying causes for this local pain but without diagnostic imagining I was unable to determine if there was an underlying cause. In treatment for trigger points, taut bands and tenderness I decided to treat once per week for at least three weeks in a row. Initially I used Seirins 0.16g for the first treatment to have Wesley become accustom to acupuncturing. I then increased the needle size to 0.20g for the second treatment. For the third treatment I added on electroacupunture for 30 minutes with 80-100 hertz for a higher frequency and 2-4 hertz for lower frequency in the mixed mode. I used Bladder 10 to treat cranial cervical spinal nerve pain, Bladder 11 and Bladder 12 to treat cervicothoracic spinal nerve pain and then Bladder 13, Bladder 14, Bladder 15 to treat cranial thoracic spinal nerve pain. I also used Bladder 17, Bladder 18 and Bladder 19 for midthoracic spinal nerve pain. Bladder 20 was used for caudal thoracic spinal nerve pain. Bladder 21, Bladder 22 and Bladder 23 were used for thoracolumbar spinal nerve pain. Bladder 27 and Bladder 28 were used for sacroiliac dysfunction. The hip triad, Bladder 54, Gallbladder 29 and Gallbladder 30 were used for hip pain. The electroacupunture was attached between Bladder 17 and Bladder 28 bilaterally. There was moderate improvement seen with three treatments of acupuncture. The owner stated Wesley was more willing to play fetch with him. He was able to play for longer intervals and seemed to have more energy. Once he came in to lie down after play his grunting seemed to have decreased. Overall, Wesley has an improved quality of life. The owner did note that Wesley’s improvements were noted more readily around day three after treatment and the positive affects seemed to wear off about one week after treatment. There were no adverse events that were noted except for keeping him from eating the needles. Lindley S Veterinary acupuncture: a Western, scientific approach. In Practice 2006;28:544-547.